Over the past couple of years, the level of personalisation customers expect from retailers has rocketed. A one off email using a recipient’s first name is no longer novel; today, marketers can (and should) adopt a cross-channel strategy that is driven and shaped by the customer. Well, instead of a customer receiving generic campaigns/messages that in no way resonate with them individually, they will receive the right message at the right time and on the best marketing channels for them. Siloed, this information isn’t particularly useful—but brought together, into a single record that updates in real-time, it creates what we call the single customer view - which marketers (and/or algorithms) can draw on to power personalised messages. With that in mind, here are five channels all you ecommerce marketers should be personalising right now, and how you can go about doing it. Automated emails are by their very nature personalised, as they are triggered by an individual’s actions. Taste profiling or category affinity: Based on customer transactional data, you can understand the categories and products customers are likely to be interested in and tailor your communication accordingly. 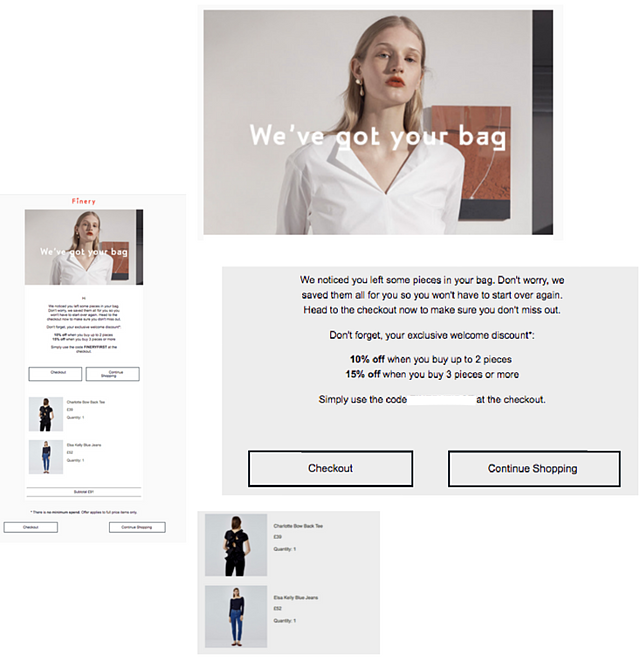 🔎 Cart abandonment email from Finery, which has been personalised by factors such as name and lifecycle stage (“exclusive welcome discount”). 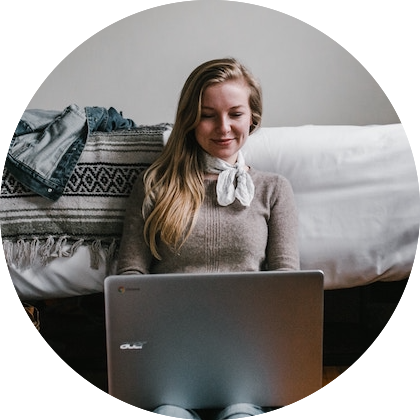 Subject line: "We saved your items"
🔎 Post purchase email from Moonpig, which has been personalised by factors such as name and purchase history (first purchase). 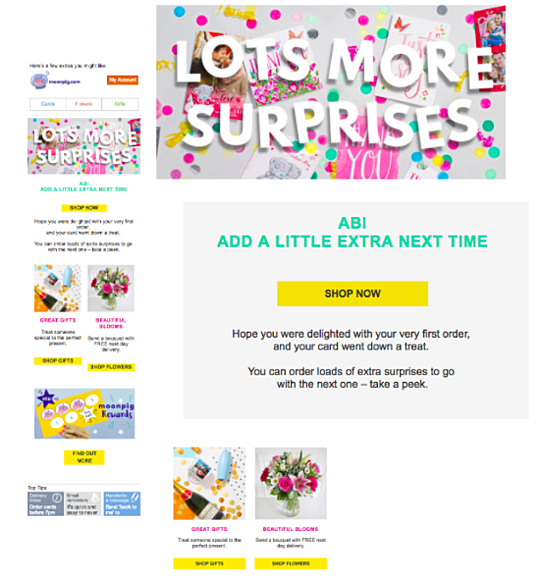 Subject line: "Abi, hope your first order went well"
For more inspiration on ways to enhance on your triggered emails, we recommend this blog post exploring what a perfect cart abandonment email should look like in 2017. Broadcast emails enable marketers to regularly stay in touch with recipients who have opted-in to hearing about a brand, usually letting them know about any new collections, blog posts, competitions or company news. With good quality content being a major industry trend right now, the broadcast email is an increasingly powerful way for marketers to show off their brand’s personality and get to know their customers better. Basic demographic information: Again, as with your automated emails, use any personal information available to make the copy of the email more personalised. (For example: first name/last name, age, gender, location, date of birth (useful for birthday discounts), whether or not the recipient is a student or any other customer data you might have. For broadcast emails, a good way to obtain this information is during the newsletter signup process. Factual information such as this can be used to give a single newsletter template the personal touch and can be achieved by using dynamic content (content that changes according to each individual customer or group of customers). By looking at a customer’s browsing and buying behaviour, you can accurately predict which content is most likely to catch their eye in subsequent newsletters. (This is what we call taste profiling). Contextual content/external factors: For example, using geographic data to determine the weather forecast in each recipient’s time zone, and then use this information to send the right message and advertise the right products. The personalised engine: Customer specific products, based on factors such as transactional history and browsing habits of each individual customer (this is touched upon in the point above on behavioural data). Some retailers also ask new subscribers or visitors to their site to fill out a “style quiz”, so they know which sort of products to recommend in the future. You can read more about the different product recommendations we offer in this blog post. 🔎 Newsletter from Wonderbly, (formerly Lost My Name) which has been personalised by: first name, purchase history and incentive. For a more in-depth analysis on how to make your broadcast emails more bespoke, we recommend reading this blog post. With worldwide email usage predicted to top 3 billion users by 2020 (The Radicati Group), it’s tempting to stick all your eggs in one basket and invest all of your marketing efforts on automated and broadcast email.However, this is not necessarily wise. Why? Different email recipients like being contacted at different frequencies; whilst some customers might be fine with receiving lots of emails from you, others might only want to hear from you one a week or month. In a survey we carried out last year, around a quarter of those aged between 18-24 cited Facebook as their favourite channel to be marketed to on - so let’s take a closer look at advertising on this channel. Unlike email, Facebook only allows marketers with a Facebook pixel to retarget individual customers with specific products (such as those they’ve left in their basket). For everything else, Facebook and Instagram Custom Audiences enables brands to target specific customer segments based on customer attributes and behaviour. It works by uploading the email addresses of a list of subscribers to social - either via a manual upload, or automated using a tool like Ometria. Instead of promoting specific products viewed, these ads could be personalised by factors such as lifecycle stage. For example, to prompt a lead to make that all-important first purchase, you could create a link ad targeting new subscribers encouraging them to ‘Shop now’, and check out your latest or top products, or to just like your page. 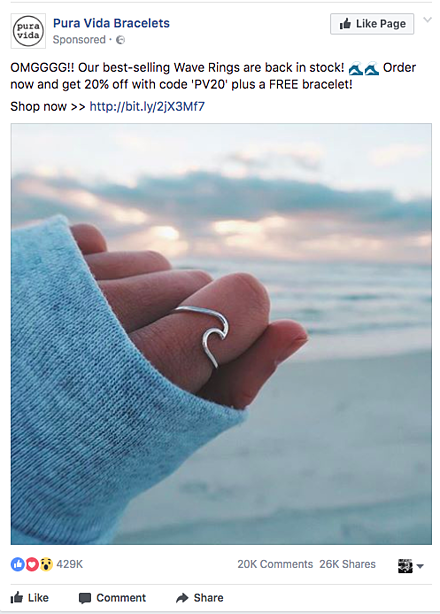 🔎 Here’s a Facebook ad from Pura Vida, inviting me to check out its best-selling Wave Rings. N.B: I haven’t ‘liked’ the brand’s page yet, but, as I’m part of the mailing list, it knows i don’t need an introduction to who they are, and instead gets straight to the point - with a small “like page” CTA in tow. If you thought personalisation was a practise reserved for online marketing only, think again. By having a detailed understanding of each and every customer (ie a SCV), marketers can rest assured their direct marketing is being sent to the correct person at the correct time in order to bring about a specific action. 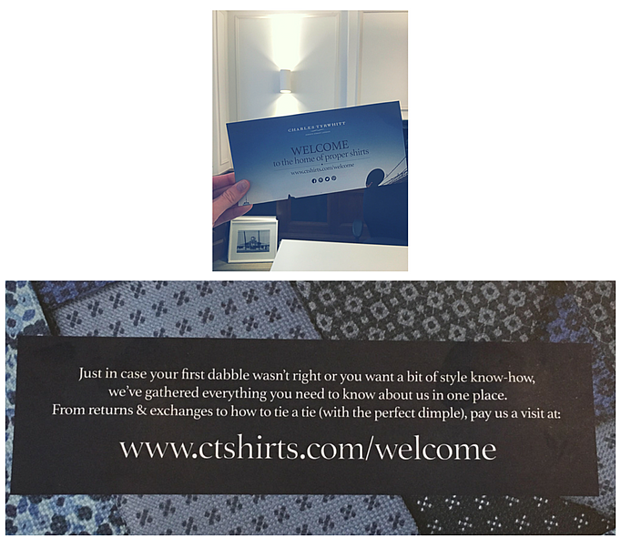 For example, to welcome new customers, Charles Tyrwhitt sends a letter in the post, complete with a personal note and cheeky discount. For more great examples of brands using data and technology to send awesome direct mail, we recommend reading this blog post. Push notifications can boost app engagement by 88 per cent, and it’s easy to see why: they are a great way to interact with customers on-the-go and in real-time. The personalisation process for mobile push notifications is much the same as email; you can trigger notifications based on customer behaviour (for example, cart/browse abandonment), or send out a broadcast notification about a sale or new collection. Having a SCV also enables marketers to be aware of what messages customers are receiving on other marketing channels (such as direct mail, social media or email). This prevents any direct replication or contradiction in marketing messages across the different channels being used, and instead ensures they work together to deliver a smooth and seamless journey. Sooner or later, marketers across the world are going to start implementing a cross-channel marketing strategy that prioritises this completely seamless, bespoke experience that ensures each and every customer feels at home with their brand. Why not get ahead of the game and start doing it now?